The coordinator at Brookdale Oceanside was very nice and very helpful. The receptionist was very welcoming and she brought someone out immediately to take us for a tour. It was very clean, and the hallways were wide enough to accommodate people with special needs as far as handicap requirements. The rooms were nice and clean. We were shown the dining room, menus, the accessibility to food between meals, and different game rooms. The outdoor area wasn't really that impressive. For the money, it was definitely clean and they were very professional and very welcoming. The rooms were like studios with a closet and bathroom. They're not furnished, but the way they had the model appointed with the suggested furniture, it was pretty nice. However, they said they handle memory patients on a case-by-case basis, and she was pretty honest about the fact that it could be quite an effort to reverse those situations. They didn't shut us out about that not being a possibility. We also did go to one more place and we told them our situation with my mom, and they didn't even want to show us a unit. Brookdale was a lot more caring and more receptive to what we were saying about our mom. Brookdale Oceanside was very good. My mom really liked it. We had a very pleasant experience. The staff was very nice, very friendly, and very informative. The accommodations were nice. There were single rooms, which were smaller, but they were nice. The staff at Brookdale Oceanside was very accommodating. They showed me the particular unit that I was thinking about and they described a really more than competitive rate for the room. I personally did like the place and I thought it was clean and it offered a lot of different things for the residents, like different day rooms and outside TV rooms. I enjoyed my tour at Brookdale Oceanside. I really liked the staff. Their facilities were fine. Their rooms were not priced as nice as the other place I visited, but I liked the facilities and the staff. My friend moved into Brookdale and seemed to be happy there. I felt the amenities were good. There were enough activities provided, and if you need to do more exercise, they bring people in to take you on walks or do stretches. There were a lot of activities geared toward helping people be stronger and healthier, and I think that's more valuable than excursions. I thought their medical personnel was very on top of things, and I got calls regarding any changes. The food and accommodations were good. They helped him set up his room. The only thing I didn't like was they quoted one price, and it ended being another. We put my mother in Brookdale Oceanside. It is a very nice facility. They have 24-hour care, which is what my mom needs. The people there really care about the residents of the facility. I think it is great, and mom is doing great. It is a wonderful place. She is in a single room. They provide three meals a day. They have a hair salon. They take care of their nails. They have a fitness facility, exercise room, and a really nice area with a fireplace for the residents to gather. They play various types of games like bingo and scrabble, and they take them on tours. They have transportation to and from medical needs or shopping. Basically, it is everything that she needs. The staff is wonderful. They are very responsive to her needs. They come in a timely manner. They treat her like she is their mom. I am very happy with them. The presentation of Brookdale Oceanside weren’t as good as the other place we went to, but they were helpful in getting us some things. The room was OK, but they don’t have any available rooms. I moved in here at Brookdale Oceanside three weeks ago. The food is good, the staff is very pleasant, and the room is OK. The common areas are pretty good, they have a family room, a restaurant, and a couple of dining rooms that also double as meeting rooms. It was pretty good. It’s close to my relatives too. They need to improve on their efficiency; they offer a lot of services but sometimes not well connected -- telephone systems and things that are important for residents. It’s clean. Brookdale Oceanside was very nice. I’ve been impressed with the staff. Their room is smaller than what we’d like for our people. They have exercise, movies, games; all varied activities. My mom lived at Brookdale Oceanside for about eight months, and they were wonderful. The room that my mom was in was not overly nice, but it served its purpose. We knew that it was going to be temporary and didn't see it as being her permanent resting place. They had seasonal socials, access to a van that would take her out shopping if she wanted to go, bingo, and a variety of activity opportunities for the residents. I am the relative of a current resident who has been at this facility for more than 6 months. This is definitely not the same place we visited when it was under previous ownership (Emeritus). The changeover has NOT been good. TREMENDOUSLY HIGH staff turnover, from the Executive Director (who is/was never there anyway) to the cafeteria workers (ALL of whom up and quit on the same day several months ago). There are a few employees who I believe really enjoy working with seniors, but there are many, many others who need to find work more suited to their personalities. Cutting activities, routinely out of food choices near month end (which represents very poor planning) and the facility itself is getting more run down and repairs are very slow to be done, if at all. We have had to fight to get contractually provided services, and we do NOT get the services we are paying for. I'm not sure any of the assisted living facilities are any better, but if you are looking for assisted living for a relative, I say KEEP LOOKING. 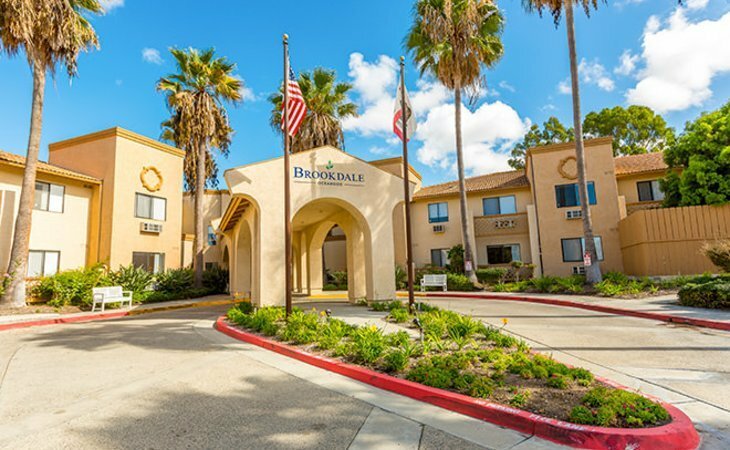 Don't waste your time at Brookdale Oceanside. They were friendly, and it looked like a very nice place. The rooms were not very large, and that was one of the drawbacks of the place. The place was nice and well-kept, clean, and everything looked nice about it; it looked like they kept the place up very well, but the rooms were small. I thought Brookdale Oceanside was a clean and friendly place, and the price was very reasonable. I visited Brookdale Oceanside twice, and I thought it was marvelous. The whole facility was beautiful, and the staff was wonderful. They had a wide hallway with couches. The meals were fine. Brookdale Oceanside was very clean and cozy looking inside. They had a fireplace and a little enclave where you could sit with the family. I asked a couple of people there if they liked it, and they said that they really liked it there. The staff was very nice and kind. They showed me all around and showed me the different suites and studios. They looked very nice and clean. They actually had a nurse there that showed us a form to see if I would qualify for aide and attendant -- which was a military pay -- and she went down and asked me a whole bunch of questions. They gave information that they don't have to give me anyway, and that was very nice. They called me and asked me how I was. I hadn't called them back, but they left a message and said "Yeah, we would like to come and see you and see how you are." I thought that was very nice. I would say the rooms were small, but I didn't see the apartments. I believed what I saw was the studio, and they had to share a bathroom. The two studios were very small. Then they showed me one, which had one bathroom that was a little bigger. However, I would have to take the suite or the two-bedroom if I would go in there in a couple of years because I had animals, and they said they accept animals so that made me happy. We didn't have lunch, but they showed us all the dietary plans they had, and they would cook specially for you. The food looked good to me when I walk past them eating. It seemed like the people who lived there seemed to enjoy themselves. They had two dining areas -- one on the first floor and one on the second floor -- and you could go to either one. They were really clean, and that's what I liked with their eating area. They had all kinds of activities. They had bingo, yoga for seniors, and arts & crafts, and they had outings to different churches. I liked the way the place was set-up, and the staff was extremely helpful. Emeritus at Oceanside was very well-maintained, and it had a homey feeling, so it felt very comfortable. The people there were nice, the staff was really helpful and friendly, and the facility was clean and very nice. I liked the looks of Emeritus. It is attractive. I thought it was modern and up-to-date. They have an outdoor area. I liked some of the apartments there. It looks like they have quite a few activities. We talked to them, and they showed us a list of their activities. They were good at answering my questions. This facility is newer. One place we went to was really old. The staff of Emeritus at Oceanside (3524 Lake Blvd.) was great; everything there was great. I saw their dining room, and the cookies they gave us were good. They said that they were changing their dining room around like it is only open certain hours now, but it will be available 24 hours in the future, which was going to be really nice. I thought it would have been really nice for the residents to feel as if they had their own kitchen, so they can go and get something or whatever they want. They seemed to have a lot of different activities to do. I was impressed by the staff. They were all really nice, and they all took the time to call and just keep in touch to make sure, before we made our decision, if there was anything that we needed to help us make our decision. I liked Emeritus at Oceanside, and it was very nice. The staff was informative; the rooms were nice and lovely. When you walked in it is very impressive, the way it is decorated, the grounds were lovely, and the place seemed secured. Mom is in memory care at Emeritus. We love it there. Their staff is top notch. We’ve had a great, many experiences. She loves to dance. They have dance music. They have so many things that she is very busy. She has even lost weight because they have such a healthy diet there, and they keep them very active. They have their whole floor. There are 2 people in each apartment. We have a key to her apartment so we can get in. The whole floor is locked with a code, and family members can get the code to get in and out of the whole floor. Emeritus at Oceanside is a nice facility and it has just been remodeled, so it's very clean and updated. The people were very nice, but the place would be a little too confusing for my brother-in-law. He has some short-term memory issues. The facility has lot of hallways and different places for activities. They also have two different dining rooms on each level. We just thought it might be hard for him to get used to, but other than that, it was very, very nice. The rooms were very nice. They have a shared room suite wherein each person has their own private room, but they share a bathroom and it significantly lowers costs, which makes it much more affordable. Emeritus was very clean and nice. The rooms were bright. It looked like they had a lot going on, like bingo and all that other stuff. I chose Emeritus because it was close to the VA Oceanside clinic for my husband. He’s there for almost three years. They usually assign someone considerate who takes care of my husband. The food is pretty good; he does not complain, and he gets what he needs. They just moved him to a lovely room; it’s got lots of sunshine, and it’s bigger than the other one he had, and he likes it. They have everything, and they have a bus that takes them to wherever they need to go, like doctors or shopping. They have a casino run every once in a while. We were not able to schedule an appointment at Emeritus at Oceanside, but when we showed up there were very accommodating as far as fiving us a tour. The people were very nice. They have us a calendar of events and all the things that they do with the residents. We were very impressed with all of them. I would give them a 3 just because it's an older building. Emeritus at Oceanside is a very nice facility. I like this place. They don't have anything to improve on. Their rooms are nice. They have activities and trips for their residents. I have also tried eating there and the meals are very good. I would recommend this place. They're all good so far. I visited Emeritus and the staff are alright. I remember they were friendly. I ate lunch there and the food was nice. I visited Emeritus at Oceanside for my sister. Their staff were absolutely incredible. They stayed with me and tried to help me at the time that I toured this facility. They were also very kind with the elderly. The facility offered an array of indoor activities. Their rooms were nice and clean. They're freshly painted and the carpets were nice. My Mother is currently living at Emeritus in Oceanside. We all have our opinions, but I have nothing but kind words to say about the staff and the care that they provide. The care staff are trained very well, the ED and Care Director's there are very attentive and knowledgeable. The building is a little out dated and it could really stand for a remodel. (Especially the front lobby bathroom) Honestly I look at the care that they are providing for my mother and not the real estate. The activities are awesome and the food is not bad at all. This is a challenging job and I give 2 thumbs up for all their hard work. If I had to do it all over again, I would not change a thing. I Love that place! It melts my heart to see my mom happy and smiling again since the loss of my father. Keep up the work! My mom stayed at Emeritus for less than two weeks. I just felt that they were not on top of the job. And there was additional charge every time the level of care increased. The staff was great they seemed to be very honest about what went on there and not trying to be fake to get us to chose them. They were also very nice and welcoming and willing to answer any questions. They actually had alot of activites there which was surprising I didn't think they would offer so much, like daily walks, bingo, and other games. The facility was nice everything seemed clean and there wasn't that dreaded "retirement home" smell so that was nice. I think that the public bathrooms could have been a little more stocked on the products and cleaner, but that wasn't a make it or break it desicion. The thing that made us not chose to go there was that the price range was a little out of our budget but if you can afford that I think that's one of the top places to go. I visited this facility with my father in June of 2012. We went there to visit his Uncle who has lived there for about a year as of today. I have been to a few of these places before and this one seemed about average. It wasn't as clean as you would expect it to be for the amount of money it costs to live there. The employees were nice and helpful showing us where to go. The overall atmosphere of the facility was OK. The tenants living there seemed to be in good spirits. My uncle says that he is content with living there, but things could be better. We did happen to eat lunch this day, the food was okay, not to bad, but not the greatest. It seems that they have a bit of activities available for the residents, but I did not get much info on those. I would rate this place 3/5. I went to emertuis to do a school charity thing and i only gave it to stars because when i would talk to all the elderly that lived there most of them told me that they were never allowed to go outside. Some of them said they had even tried to escape. Im sure alot of it was there dementia and sickness but still i felt that was a little disturbing to hear. The facility was pretty clean just had that "old people smell" to it and the bathrooms always had toliet paper on the floor. I heard the food was awful there but i never actually got to try it. I do know they had activites which i think is good like bingo and games of that sort. When we visited the facility, I find that the people around were very warm and kind. We were impressed with the facility with their grounds and the way it was kept up. My mother got a very spacious apartment. We had lunch there several times. The food was better than I expected. I think it was good. They have a lot of activities inside. In fact they post a list every week of everything that they'll be doing. My mom hasn't taken advantage of it yet. The activities are pretty comprehensive. This facility is okay but very old and is like a 1970's building. They really need to update the place. They showed me one of the rooms and it smelt really bad because the carpet was nasty. They need to rip it out and put a new carpet in. On the lighter side the people there were nice and helpful when I toured the place. Maybe it's just one of those days where you show up and it wasn't that nice. Maybe if I have gone there some other time, there would be a new carpet and stuff. My mom went into Memory Care there around the first of the year. I have nothing but good to say about them. They are wonderful and very attentive. They keep the residents engaged and involved. I like the idea that they're right on it. They keep the people engaged and not sitting off in a corner with no one tied to wheelchairs like in a nursing home. They were doing mind games with them, and doing a little bit of exercise with them. I was very impressed with that. It's an old facility, not glamorous, but it has exactly what she needs. Whenever the whole family gets together with her, they have a place off to the side, out of the unit where we can meet with her and have birthday parties and such. The only thing is that I don't feel that they took enough time to bring her out into the general population. But it all worked out better for her and better for us. I need to find a place for my mom. So I jumped at the chance to visit a friend's mom and it really smelled bad. It was a disgusting urine smell that soaked into my clothing during the visit. My friend was upset because the staff didn't seem to do much during the visit. No one said hello. The patients seemed really sedated and without activities. I still haven't sellected a place for my mom, but I know she's not going to Emeritus. Brookdale Oceanside was very nice. The staff was very personable and very nice. The place was not big, but it was clean and very nice. However, my mom didn't qualify. I didn't see the rooms, but the dining area was nice. The place seemed clean. Will be getting a remodle starting december 1st, 2013. We have a Fireplace area to sit by. What should caregivers and potential residents know about Brookdale Oceanside?